The Nevada [Iowa] Journal reports that the town’s Lincoln Highway Days committee has revamped its web site to include more info and images. The long-running annual event will take place this August 28-30. The updated site was created by Camp Registry, a company in Ames, Iowa, that builds sports camp Web sites around the country. The site, www.LincolnHighwayDays.com, will allow board members to update the site themselves with announcements, board minutes, and photos. Community members can volunteer to help with the celebration or sign up for the parade through the site, and are encouraged to submit their own Lincoln Highway Days photos, information, and announcements. A quick look, however, found some broken and misdirected links for now. This entry was posted on March 27, 2009 at 10:41 am and is filed under highways, history, Lincoln Highway, travel. You can follow any responses to this entry through the RSS 2.0 feed. You can leave a response, or trackback from your own site. 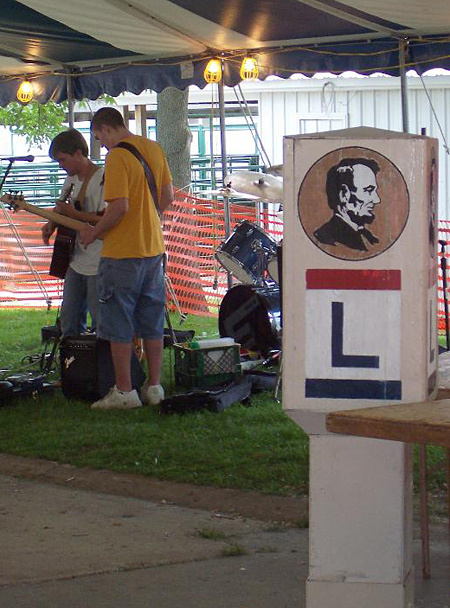 Was disappointed that the Lincoln Highway Days’ booth was unattended a great deal of the time at the fairgrounds during [Nevada, Iowa’s] LHD’S. Had wanted to ask questions about the library coins and belt buckles but no one there to talk to. Also astonished that the buckles, coins, and T shirts there were left unattended. Think your booth could have been better placed. Are you still selling/issuing buckles and coins?